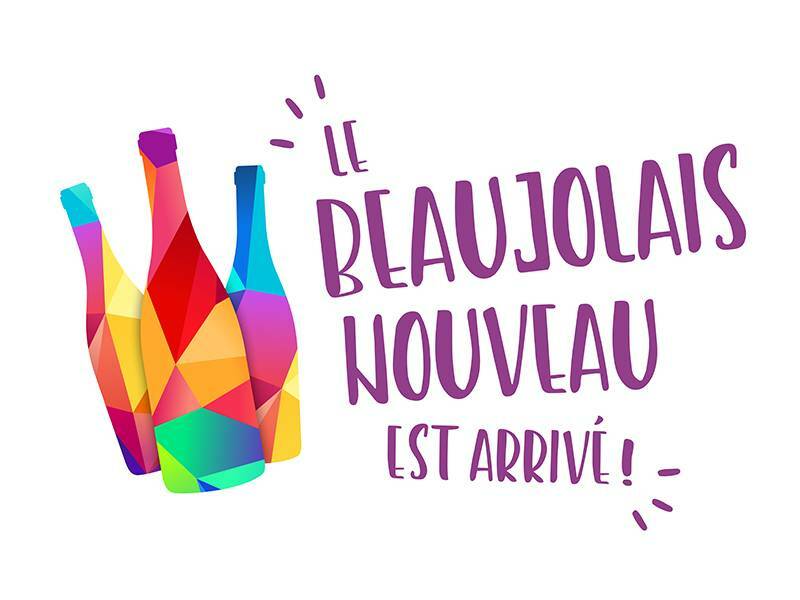 Blog - November 15th is Beaujolais Nouveau day - City Vino, Inc. This Thursday, November 15, is Beaujolais Nouveau day. This day is celebrated yearly at more than 120 festivals in the Beaujolais region of France, which is located just south of Burgundy. The day officially marks the end of the year’s harvest. The Beaujolais Nouveau wine produced from this year’s harvest is fermented, bottled and released every third Thursday of November at 12:01 a.m., regardless of when the harvest actually occurred. The art work on the label is a big part of the celebration each year, too. Beaujolais Nouveau is made exclusively from the Gamay grape. By law, the grapes must be hand-harvested, and the wine is made using a winemaking technique called "carbonic maceration," or "whole berry fermentation." The whole clusters of Gamay grapes are loaded into a tank that is sealed and then filled with carbon dioxide. The grapes at the bottom of the tank are gently crushed by the weight of the grape clusters above them, and then start to ferment. Enzymatic reactions occur within the grapes that didn’t get crushed and a different type of fermentation results, creating a small amount of alcohol (approximately 3 percent). This process is allowed to continue for anywhere from 5 to 15 days and then the grapes are pressed, which is a process of separating the juice from the skins, stems and seeds. The juice will then go through a regular fermentation, turning the remaining sugar into the alcohol-yielding, final wine. Beaujolais Nouveau is purple-pink in color which definitely reflects its youth and vibrancy. The method of winemaking yields little tannin and the wine often displays fruity flavors of cherry, strawberry, raspberry or grape. The wine is light-bodied, fruity and typically served chilled. This style of wine is intended for immediate drinking and it generally doesn’t improve with age. The wine is very food-friendly, and pairs well with cheeses, roasted turkey or chicken, wild rice, roasted squash, and cranberries, and as such would make a great wine to have on your Thanksgiving table. If you are looking for a wine less fruity with more of an ability to age, try Beaujolais Nouveau’s bigger brothers, Beaujolais Villages and Beaujolais Cru, which are also made from the Gamay grape, via traditional winemaking techniques.